While taking about the best and affordable laptops, MSI is probably one of the best. For the people who are looking at the highest 3D performance machines, the models like GE60 are easily affordable. MSI’s latest CX series of laptops offers much more useful designs and are also available in more affordable price range of $800. CX’s dimensions are same as that of the GE series but it lacks a bit if design flourish. In order to keep the costs down, lot of plastic is used throughout the CX series laptops, and because of that they don’t carry the same level of quality as compared to more expensive laptops. This particular review is about MSI’s latest low range gaming laptop model CX61 0NF-258US, and we are going to examine its number of features and also review where it lacks from its competitors. You will be surprised to see that CX61 0NF-258US is powered with the quad core Intel Core i7-3630QM, because there are very few that exists in this range of laptops. The CX61 is also loaded with 6GB of DDR3 RAM, making it one of the fastest and ideal for running latest games that require a very fast machine in order to run smoothly. The MSI laptop ONF-258US is also packed with mega 750GB hard drive that is more than enough for years of storage requirements. Now you can download and install thousands of games, movies and application with the fear of storage limitations. The only downside is the lack of speed that decreases the performance, as the MSI laptop consists of traditional 5400 rpm hard drive instead of new faster 7200 rpm hard drives. The difference can be felt in much slower boot timing of the MSI ONF-258US laptop. However, there two USB 3.0 ports available that can be used to connect to high speed external hard drives. The MSI laptop also has an optical drive that used a dual layer DVD burner for running and recording CD or DVD. The screen is undoubtedly the best feature of the CX61 laptop, which offers a very high resolution 15.6 inch panel. This screen does a very good job with brightness and color but not as good in terms of sharpness from the extra resolution. The CX61 is loaded with NVIDIA GeForce GT 645M graphics card with 2GB of memory. It is almost identical to the GT 650M but lacks in clock speed, which results in slightly lower graphic performance as compared to the GE series. You will be able to play all the 3D games but will struggle to run at maximum resolution. The multi-touch support is a bit disappointing but the battery of the MSI CX61 is really good. When tested with digital video playback, the laptop lasted three and a half hour, which is standard timing for a 15 inch laptop. The MSI CX61 0NF-258US is indeed one of the best choices for someone who wants a high resolution display, 3d graphics and top performance laptop at an attractive $800 price tag. 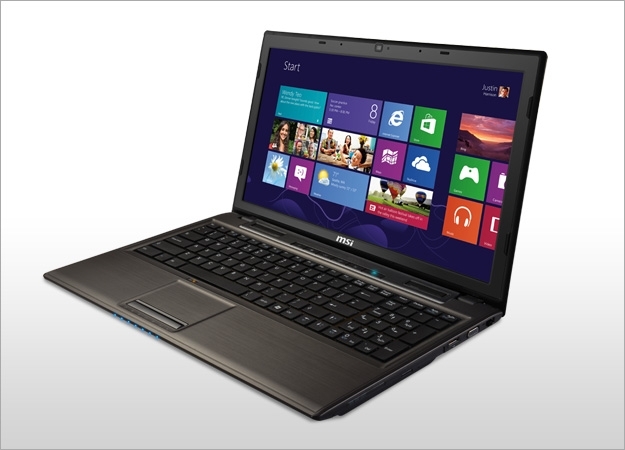 It is almost impossible to find a similar high specification gaming laptop at this range. There are also few negatives, which includes a body that mainly consists of plastic exterior, difficult to navigate track-pad and multitouch system and a slow speed hard drive. If you can afford a couple of hundred buck more, you can find much better options but it this price the MSI laptop ONF-258US laptop is the best.